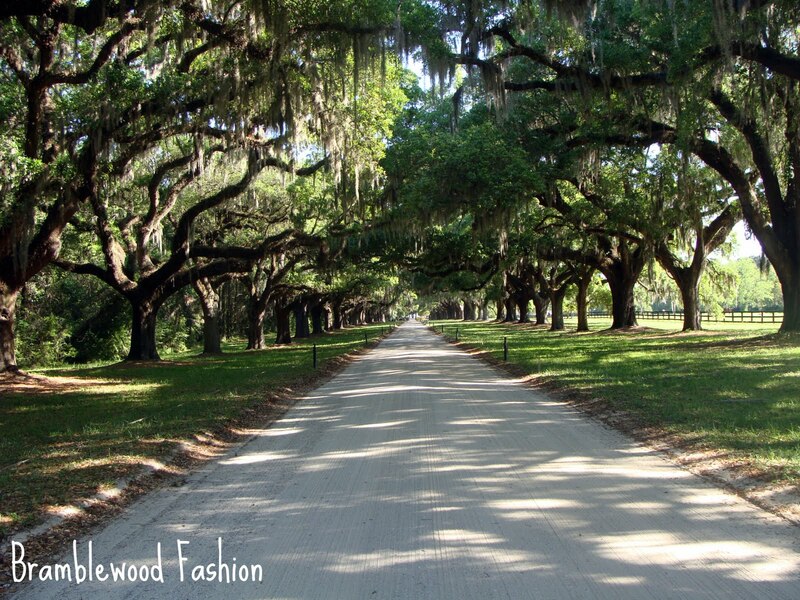 Bramblewood Fashion | Modest Fashion & Beauty Blog: What I Wore in Charleston, SC + Photos from my trip! 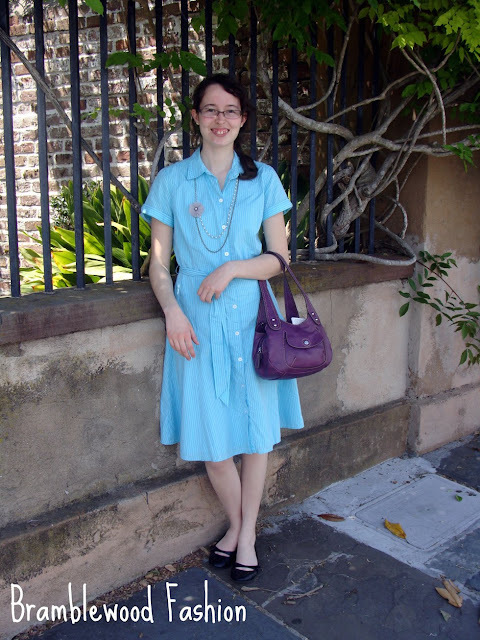 What I Wore in Charleston, SC + Photos from my trip! WARNING! Lots of pictures ahead! =) LOL! 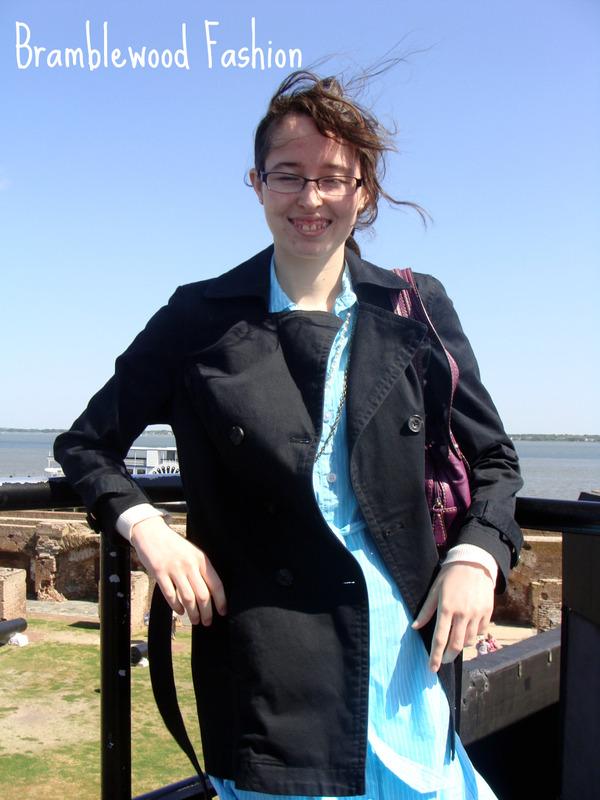 On our first day in Charleston we visited Fort Sumter, King Street (High-end shopping area. We only window shopped. ), and two historical homes. They were the Edmondston-Alston house and Heyward-Washington house. Berlin's a store that has been there since 1881! A $175 dress my mom and I feel in loved with. Minus the price of course. I would love to recreate this knit wrap dress, someday. ;) You gotta love those pockets and sleeves! The ruffles and shabby chic look of this dress, grabbed my attention. Another look at the dress, but from across the street. One lovely nightgown and housecoat/dressing gown. A darling little girls dress. Kinda 1930s, yes? Darling nautical themed clothing for a boy and girl. 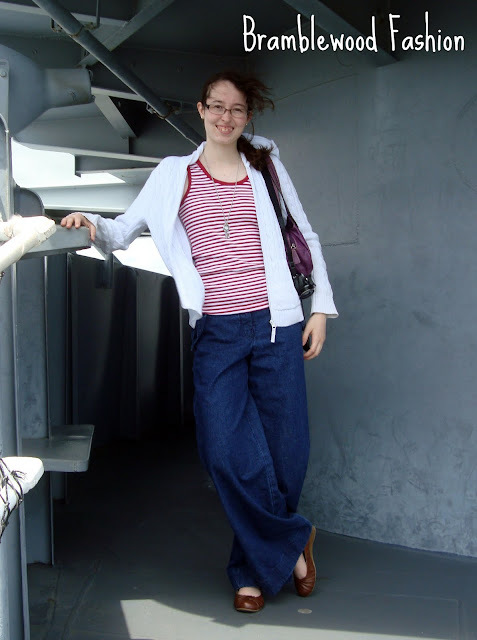 On day two we went to Drayton Hall, Patriots Point, and Fort Moultrie. Today's theme for my clothes was...Nautical! Ashley River at Dryton Hall. The view of Drayton Hall from the river. Drayton Hall from the driveway. One of the many fireplaces in the house. USS Clamagore in Patriots Point. One of the many planes. 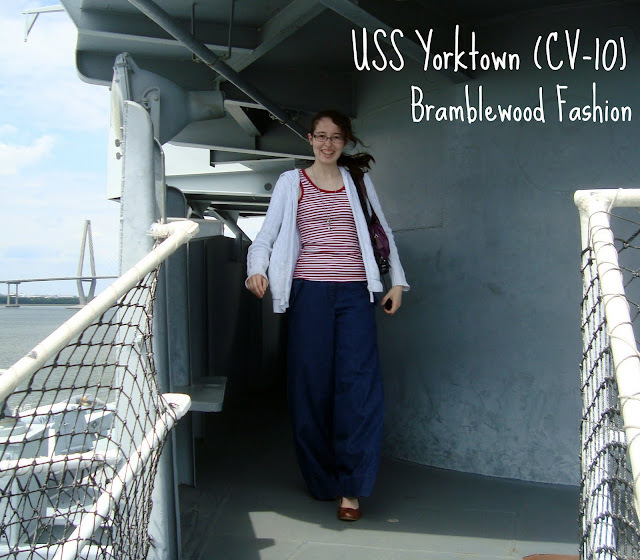 Small part of the USS Yorktown (CV-10). I will share with all some pictures I have of Boone Hall Plantation. Which was beautiful! What lovely pictures!! I want to visit SC sometime...(I've driven through before, but not spent time there). Wow! Thanks for sharing pictures! what a great trip! Your nautical outfit is to die for! I LOVE it. Inside Drayton Hall and the Boone Hall driveway looked like sets from 'The Patriot'. Any idea if scenes were filmed there? Lovely pictures! Make me want to visit SC someday! I live in charleston and I love it here! I glad that you had fun! :) God bless! Looks like you had a great time in SC!! Thanks so much for sharing, Ashley! I loved your outfits. I also enjoyed seeing pictures of SC. I haven't been there for a long time, but would love to see it again in the future! Some of my relatives lived on a plantation there, so it holds a special place in my heart. So glad you had a wonderful trip! PS that Nautical themed outfit was perfect. I love to dress up too! *sniff* SC is waaaaaay too far away for me! :(:: But it looks lovely! The house looked like something out of the Pride and Predjudice movie! Great blog, and thanks for posting the great pictures you took of your visit to Charleston and Drayton Hall. Given your interest in fashion, and in Ann Taylor specifically, I thought you would be interested to know that the recent Ann Taylor catalogue was shot at Drayton Hall. If you look closely at the images you posted on May 5, you'll see models posing on the upper portico, in the doorway leading into the basement, and in other areas on the the first floor. Quite a coincidence! Keep up the good work and we hope you have a chance to visit us again soon. These photos were absolutely gorgeous. It looks like you went on a fantastic trip, thanks for sharing! I live in Charleston also. Some of "The Patriot" was also filmed at Cypress Gardens and Society Hall (where my husband and I were married). Don't miss the Aiken-Rhett house the next time you go. It's my favorite along with Drayton Hall. that blue dress is so pretty! !